A journalist working for several media institutions was assassinated (Thursday) afternoon in Iraq. The Journalistic Freedom Observatory (JFO) mourns our colleague Sahar al-Haydari, press correspondent for the independent agency “Voices of Iraq/Aswat al-Iraq,” and the National Iraqi News Agency “NINA” and for the Institute for War and Peace Reporting in Iraq. Unknown militants assassinated Sahar al-Haydari Thursday afternoon in the Hudaba’ area on the right bank (of the Tigris) in Mosul, after opening fire on her, killing her on the spot. Previously, Haydari experienced a number of assassination attempts, most recently in February of last year, when she was working as a broadcast correspondent, when she also received a several death threats. Haydari had informed the director of the JFO a week ago that she had received around 13 death threats from unknown parties, describing two letters written by hand and placed in the door of her home, and 11 threats by telephone, of which six calls were from unknown numbers, threatening to kill her, and five other letters with the same contents. Al-Haydari’s colleagues informed the JFO that the name of their colleague Sahar al-Haydari’s name appeared in a list (of names) targeted by militant groups in Mosul, which included nine journalists, and that this list had been hung on several of the walls of mosques in the city. Al-Haydari was born in Baghdad in 1962 and obtained a BA in media studies, married with three daughters, and lived in Mosul. She worked as a press correspondent for several agencies in addition to the Institute for War and Peace Reporting, which said that it received the news about its correspondent, al-Haydari under a heavy weight that could not be loosed. With this news, Mosul has now seen 35 journalists and technicians killed since the US invasion. JFO counts Mosul, in northern Iraq, as the second most dangerous city in the world to work as a journalist, after Baghdad, the capital. 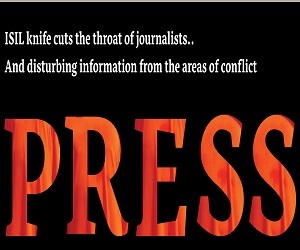 Iraq witnesses great violations against journalists and media workers, where acts of violence and the deterioration of the security situation has led to the killing of 195 workers in the media, among them 105 journalists killed because of their journalistic work, and likewise 39 technicians, while ambiguity surrounds 61 operations that targeted journalists and technicians in an indirect way (i.e. they were not targeted because of their press work). And in less than two weeks three journalists have been killed, among them Dr. Abd al-Rahman al-Esawi, along with seven members of his family in Falluja, after which Nizar al-Radi was killed when an armed group fired upon him in Maysan Province, whle he was with a group of journalists preparing to attend a workshop for journalists in the city. The JFO demands that the local government in Mosul open an urgent investigation in order to learn who stands behind the assassination operation of our colleague Sahar al-Haydari, and to publish the list of assassinations that were published, and in the least to offer protection to the rest of our colleagues whose names appear on the list. JFO also demands that the government go to the farthest measures to provide them with the necessary protection. 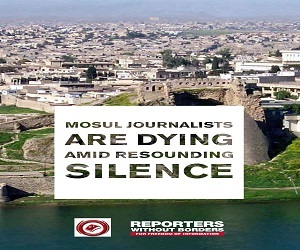 And the JFO does not forget the religious scholars in Mosul and the role that they could play to lessen the extent of the targeting of journalists in Mosul, where the JFO demands that they show support to journalists and to recognize their noble mission. 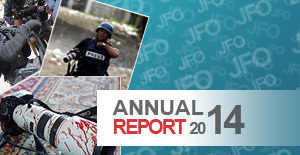 The Journalistic Freedoms Observatory (JFO) is an independent organization, based in Baghdad that monitors and defends journalists and the freedoms of the press. Its website is www.jfoiraq.org.